“Graduate students may be required to withdraw from a graduate course or program due to unsatisfactory performance or academic or non-academic misconduct” (Graduate Academic Calendar). Satisfactory progress of thesis, MRP or research paper. Continued communication with Supervisor and/or Supervisory Committee. A charge of academic misconduct. A charge of non-academic misconduct. The Faculty Handbook outlines Continuation in a Graduate Program and Minimum Academic Performance in section 14.7.13. 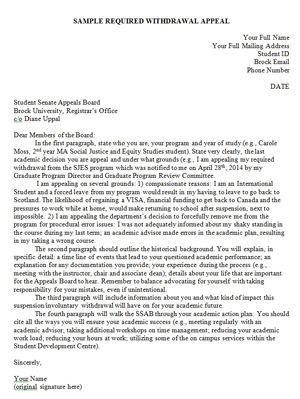 Graduate students may appeal the Program Review Committee’s decision that requires a student to be withdrawn from a graduate course or program. Students must clearly notify their Graduate Program Director and Graduate Program Review Committee of their intent and grounds for appeal. Formal letter is preferred. If the student is not satisfied with the outcome from their Graduate Program Review Committee /GPD, the student may then refer the matter to the Faculty Dean and the Dean of Graduate Studies. If the student is not satisfied with the joint decision of the Deans, the student may then appeal to the Senate Student Appeals Board. The process for submitting a formal appeal to the Student Senate Appeals Board is outlined in detail in section 14.11.2 A and B and are outlined in the Graduate Calendar. Take advantage of the Essential Skills Building offered by Graduate Studies and the workshops specifically geared towards Graduate students via A-Z Learning Services. Speak openly with your previous supervisor and committee or work hard to secure this support network. Reach out to your Graduate Program Director. Outline all that has been completed and yet to be completed for your degree. Propose a timeline for coursework, proposal, writing and defence. Consider opening up about the reason for your voluntary withdrawal OR outline the steps you have taken since your required withdrawal to increase your probability of success. Identify any needs for funding or employment. What were the key reasons you have not been successful in your Graduate Program at Brock? If you feel your performance was due to circumstances (e.g., health issues, financial pressures, family obligations, personal problems), how will you better manage those circumstances in the future, should similar issues arise? If your academic performance was due to your time management, class attendance, study skills etc., what steps will you take right now to change those habits? Use your period of withdrawal to reflect on and address the factors that led to your poor performance. Meet with your Graduate Program Director and Supervisor. Be proactive in understanding the full extent of your academic standing within your program. Meet with a counselor or Psychologist in Personal Counselling Services via the Student Development Centre to address personal issues that have been barriers to your success. If applicable, become familiar with the resources and services available for students with disabilities. Work with our Case Managers to see if/what accommodations could help improve: taking notes in lecture, getting extra time or a different environment to write exams; assistive technology and more. o Get registered as a student with a disability. o Get documentation to provide to professors and TA’s. Explore Major and Career options. Determine if you can successfully earn your desired program and degree at Brock or if your interests would be best served at another college or university. o Consult Career Services to get career advice and use the Career Assessment Tool. o Perform an in-depth review of programs through Brock’s Undergraduate or Graduate Calendar including course/program requirements, entry standards, and graduation requirements. Academic Advisors can help. o Review your program guide by visiting your department’s website and searching for your program. Develop your learning and writing skills with workshops and tutorials from A-Z Learning Services. RETURN TO UNIVERSITY … at the right time for you. Are you able to focus on your course work and dedicate the time you need for school? Do you have a personal support network to get you through difficult times? Do you have academic support to help you navigate the school year? Are you balancing work, school and personal matters in a way that will allow you to be successful? Have you fulfilled the entire suspension or debarment? If so, be prepared to outline how you spent your time away from school. Contact Diane Uppal [email protected] x3249 for guidance on re-entering Brock after you have fulfilled your suspension or debarment. To get information about the re-entrance procedure. To attain guidance on your re-entry letter. To get a timeline on when your re-entry application will be considered. Plan your re-entry long in advance. You should have your letter written and submitted by the spring preceding your fall entry. If you wish to appeal your suspension, please see the Ombuds Guide to Suspension.